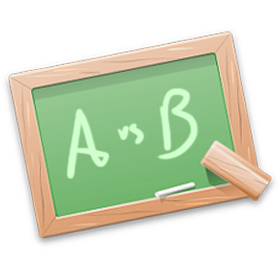 A/B Email Testing – What Works For You? Want to increase your campaign performance? A/B email testing can help you get the most out your email marketing strategy. Put simply, A/B email testing is developing two similar campaigns and analyzing the results. Here are some of the questions you can answer by performing your own A/B email testing. What day of the week is the best time for you to send? What times of day are the best to send? What subject line works best? Which type of creative should you use? What “From Name” delivers the best the results? A/B email testing is simple. Start off by creating two small contact groups. Leave every aspect of the email campaign the same except for the variable you are testing. In the example below, we are testing which “From Name” will work best. In this example, we will send the same email, subject line, and reply-to address to two different groups of the same size on the same day at the same time. The only difference between the two campaigns will be the “From Name”. After the all the stats are generated, examine which campaign performed the best. Once you have picked your winner, send to the rest of your list with the winning “From Name” to get the best results. A/B email testing is simple, effective, and can drive performance. Call one of our email marketing experts toll free at 888-497-7898 to find out more.